Liquid foams are concentrated dispersions of gas bubbles in a liquid, stabilized by surfactant molecules or nanoparticles adsorbed to the interfaces. The mechanical behavior of foams can be solid-like or liquid-like, depending on packing fraction and applied stress. This feature, combined with their low density and their large specific surface, gives rise to many applications, ranging from foamed pharmaceutical products, food to oil production or civil engineering (tunnel boring, foamed concrete…). Mechanical response strikingly similar to the one of foams is found in a large class of materials containing droplets or grains : Emulsions, pastes and other concentrated suspensions. When they are strongly diluted in a fluid, these dispersions flow like a liquid, whereas beyond a critical volume fraction, the particles (grains, bubbles, drops…) have so many contacts with their neighbors that the material is jammed. This transition towards solid-like viscoelastic behavior and its evolution when even more continuous phase is extracted raise many fundamental questions. How do bubbles, drops or grains rearrange when the solid is forced to flow by an applied stress ? What is the role of collective bubble dynamics, such as avalanches ? How much of the physics of hard granular materials carries over to soft grain packings ? What is the origin of viscoelastic dissipation in foams ? We investigate these questions experimentally by combining macroscopic mechanical measurements to local probes of the dynamics, such as multiple scattering of coherent light. In addition, we perfom ab initio numerical simulations that provide insight into processes on the bubble scale inaccessible to experiments. We use foams as model systems that help to clarify the origin of dissipation, elasticity and plasticity in soft particle dispersions. Our experiments not only show to what extent the mechanical response of foams and granular suspensions is analogous close to the jamming transition, it also highlights features that make foams unique, compared to other particle dispersions : Depending on the adsorbed surfactants, the interfaces can behave as if they were rigid and almost incompressible, or if they were mobile and highly compressible. These two possibilities lead to totally different flow patterns in the liquid surrounding the bubbles. Foam rheology is thus a multiscale phenomenon where macroscopic response results from a coupling of phenomena at the bubble scale where the packing disorder matters, as well as at the molecular scale where surfactant physico-chemistry matters. Understanding the solid-like and liquid-like foam behavior therefore requires a multidisciplinary approach. Linear and non-linear wall friction of wet foams, M. Le Merrer, R. Lespiat, R. Höhler, S. Cohen-Addad, Soft Matter 11, 368-381 (2015). Rheology of foams and highly concentrated emulsions, S. Cohen-Addad, R. Höhler, Current Opinion in Colloid & Interface Science 19, 536-548 (2014). Multiple light scattering as a probe of foams and emulsions, R. Höhler, S. Cohen-Addad, D.J. Durian, Current Opinion in Colloid & Interface Science 19, 242-252 (2014). 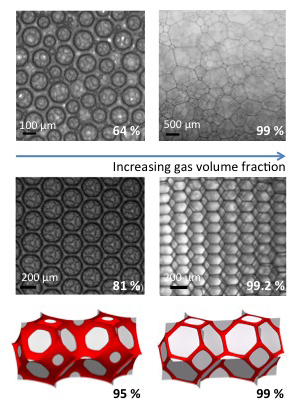 Closed-cell crystalline foams : Self-assembling, resonant metamaterials, A. Spadoni, R. Höhler, S. Cohen-Addad, V. Dorodnitsyn, J. Acoust. Soc. Am. 135, 1692–1699 (2014). Laser speckle visibility acoustic spectroscopy in soft turbid media, F. Wintzenrieth, S. Cohen-Addad, M. Le Merrer, R. Höhler, Physical Review E 89, 012308 (2014). On the existence of a simple yield stress fluid behavior, G. Ovarlez, S. Cohen-Addad, K. Krishan, J. Goyon, P. Coussot, Journal of Non-Newtonian Fluid Mechanics 193, 68-79 (2013). The dissipative rheology of bubble monolayers, S. Costa, S. Cohen-Addad, A. Salonen, R. Höhler, Soft Matter 9, 886-895 (2013). The coupling between foam viscoelasticity and interfacial rheology, S. Costa, R. Höhler, S. Cohen-Addad, Soft Matter 9, 1100-1112 (2013). Liquid dispersions under gravity:volume fraction profile and osmotic pressure, A. Maestro, E. Rio, W. Drenckhan, R. Höhler, Soft Matter, 9, 2531-2540 (2013). Flow in foams and flowing foams, S. Cohen-Addad, R. Höhler, O. Pitois, Annual Review of Fluid Mechanics 45, 241-267 (2013). Duration of bubble rearrangements in a coarsening foam probed by time-resolved diffusing-wave spectroscopy : Impact of interfacial rigidity, M. Le Merrer, S. Cohen-Addad, R. Höhler, Physical Review E 88, 022303 (2013). Louvet, N., Höhler, R. & Pitois, O., « Capture of particles in soft porous media ». Physical Review E 82, 041405 (2010). Lespiat, R., Höhler, R., Biance, A.-L. & Cohen-Addad, S., « Experimental study of foam jets ». Physics of Fluids 22, 033302 (2010). Krishan, K., Helal, A., Höhler, R. & Cohen-Addad, S., « Fast relaxations in foam ». Physical Review E 82, 011405 (2010). Ovarlez, G., Krishan, K. & Cohen-Addad, S., « Investigation of shear banding in three-dimensional foams ». Europhysics Letters 91, 68005 (2010). Lespiat, R., Cohen-Addad, S. & Höhler, R., « Jamming and Flow of Random-Close-Packed Spherical Bubbles : An Analogy with Granular Materials ». Physical Review Letters 106, 148302 (2011). Le Merrer, M., Cohen-Addad, S. & Höhler, R., « Bubble Rearrangement Duration in Foams near the Jamming Point ». Physical Review Letters 108, 188301 (2012). Biance, A.-L., Calbry-Muzyka, A., Höhler, R. & Cohen-Addad, S., « Strain-induced yielding in bubble clusters ». Langmuir 28, 111-7 (2012). Stoffel, M., Wahl S., Lorenceau E., Höhler R., Mercier, B., Angelescu, D., « Bubble Production Mechanism in a Microfluidic Foam Generator ». Physical Review Letters 108, 198302 (2012). Yip Cheung Sang, Y., Lorenceau, E., Wahl, S., Stoffel, M., Angelescu, D., and Höhler, R., « A microfluidic technique for generating monodisperse submicron-sized drops », RCS Advances, (2012). « Les mousses : Structure et dynamique », Cantat I., Cohen-Addad S., Elias F., Graner F., Höhler R., Pitois O., Rouyer F., Saint-Jalmes A., Collection Echelles, 2010, Belin, Paris. « Foam Rheology » in « Foam Engineering : Fundamentals and Applications », Denkov N., Tcholakova S., Höhler R., Cohen-Addad S., Edited by P. Stevenson, 2012, J. Wiley. « Foams » in « Soft Materials : Generation, physical properties and fundamental applications », Höhler R., Cohen-Addad S., Edited by A. Fernadez-Nieves, 2012, J. Wiley, USA, in press. « Foams : Structure and Dynamics », Cantat I., Cohen-Addad S., Elias F., Graner F., Höhler R., Pitois O., Rouyer F., Saint-Jalmes A., Edited by S. Cox, 2013, Oxford University Press.